We want to know: How do you feel about this semester? Welcome back to Georgia State, your home away from home in the heart of Downtown Atlanta. With classes in full swing and summer coming to a close, The Signal is catching up with students to hear their outlook on the fall semester ahead. 1. What are you most looking forward to in your first year at Georgia State? “I’m looking for new experiences like making friends, living on my own and getting involved through a sorority,” Makayla Pacol said. 2. Do you have any fears this year as a freshman? “I’m nervous about getting lost on campus and about the workload of college,” Pacol said. 3. What do you want to achieve academically? “In high school I made a habit of procrastinating and waiting until the last minute to do absolutely everything. I hope that this year I can stay on track and be up to date with all my classes,” Destiny Masha said. 4. What do you want to achieve non-academically? “I’ve always been super enthusiastic and I’ve already affiliated myself with a bunch of fun clubs and have met some amazing people. I’m stoked for this year,” Masha said. 5. What is your favorite thing about Georgia State so far? “My favorite part about Georgia State has to be a tie between the location and the general diversity of campus. Atlanta is so gorgeous, and I enjoy exploring between classes. The people are so kind and open to new ideas and experiences,” Masha said. 1. How do you feel about your major? Are you set on a major, planning to change your major or undecided? “I’m a film and media major. I think my major is really cool and interesting. I love it and I’m super excited to go into the behind-the-scenes world of movies and learn more,” Nina Palmieri said. “I’m definitely set on this major. I’m not planning on changing it, but if I were to change it, it’d be something similarly creative and just as up and coming as film and media,” Palmieri said. 2. What classes are you taking for your intended major this semester? “I’m majoring in game design. My classes are critical thinking, intro to gaming industries and film,” Johnny Duong said. “I’m glad this school has it. It’s a major I’m actually enjoying. I do play a lot of games and I enjoy how they feature in storyline gameplay and how it relates to real life. I enjoy having a major I can actually relate to,” Duong said. 3. What is your biggest regret from freshman year? “My biggest regret from freshman year would have to be not going to enough parties. My friends and I would have super fun hang outs in our rooms all the time but I wish I had gone out to some bigger parties to meet new people and to have new experiences,” Palmieri said. 1. Have you changed your major? If so, to what and why? “I changed it my first semester. I was a film and video [major]. Now, I’m political science. It was during the elections and it became more of a passion than an interest,” Austin Birchell said. 2. What have you gotten involved in at Georgia State? How has it helped or not helped you to become more socialized on campus? “I work for Public Relations and Marketing Communications, I’ve worked on housing, I’ve been a tour guide, I was even once a [Student Government] Senator. 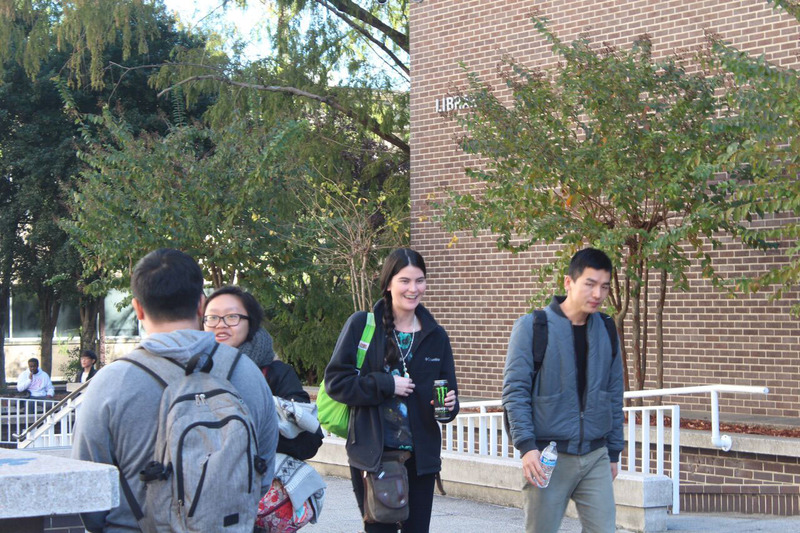 Connections have been the most important thing about college,” Birchell said. 3. Any worries about this semester? If so, what? “It’s my first year commuting and I’m coming from Dahlonega. I’m worried about internships because I’m actually at that part of my life,” Margaret Williams said. 4. Have your study habits changed since freshman year? What works best for you? “I used to cram it all in two or three hours. Now I know that’s not the best for my brain and for the outcome. I’m trying to do smaller amounts of studying because it’s better for how I learn, and I don’t freak out all the time and try to cram,” Williams said. 1. How do you feel about your last year at Georgia State? Are you excited to progress into the future or are you upset about leaving the campus? “I’m ready to go. I’ve been taking all these classes for a long time. But, I’m still on the fence about the future,” Amina Daugherty said. 2. How do you hope to leave your mark at Georgia State? “I’m in the art program, so I’m just doing really good pieces that will be remembered after I leave,” Daugherty said. 3. What will you never forget about your experience at Georgia State? “The advisors help you a lot. When I first came here, I always thought about transferring to other schools, but a lot of people help you and make you want to stay here. They will help you when you have questions,” Van Ha said. 4. Any advice to give to underclassmen for their semester ahead? “Start studying. Instead of trying to raise your GPA [later], start high. Enjoy your freshman year but keep going with your work,” Ha said.